Toyota developing active safety technology (Active Safety) is to help ensure the safety of cars and help drivers to avoid accidents. Active safety is a safety technology that perantinya regulated by an electronic device or computer. ABS, EBD, and BA is one of the active safety created by Toyota for the braking system. ABS is an active safety systems that keep the wheels of the vehicle to continue to have traction with the road surface due to the braking action of the driver, and prevent the wheels locking. ABS consists of sensors, modulators, and valve control unit. Sensors mounted on wheels to detect wheel when braking and starting locked, provided by the sensor signal is transmitted by a control unit which consists of several modules for a locked wheel and modules to provide a signal to the modulator pressure for the tires to spin, just the pressure off, the brakes work again and this process works very fast resulting in vibrations in the brake pedal. ABS as an active safety devices require support for some of the unexpected when braking in an emergency such as sudden braking. Several observations indicate that some drivers do not step on the brake pedal fast and powerful enough to perform in a panic braking or sudden. 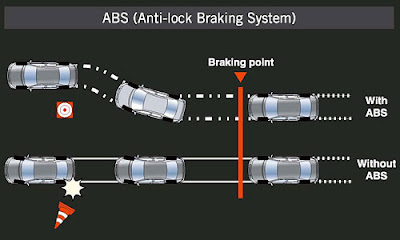 BA (Brake Assist) function to help increase the pressure of the brake pedal when there is a sudden event, because the ABS system conditions must touch the brake pedal a vengeance. Supporters of other active safety systems in the ABS is Electronic Brakeforce Distribution (EBD). Component of this support function setting the braking power distribution to all wheels electronically in accordance with the conditions of sharing the burden borne by each wheel vehicle. All three devices are combined into a ABS + EBD + BA to work optimally and support each other to produce an effective braking system when braking or on slippery roads. Toyoa Camry, Corolla Altis, Vios, Fortuner, Rush, All New Avanza 1.5 Veloz and the Yaris has been using active safety features like ABS, EBD and BA.